On Monday I dropped my phone on the way to class. I use my phone to get into my apartment building, so I didn’t notice until I got home. Inconvenient. Luckily the phone was discovered by some folk who bothered to get in touch with the person I had texted most recently: Marq. With his help the people got my phone back to me and all was well. Reviewing the texts between Marq and the helpful people I learn that when they first contacted Marq and told them they had found a phone, he saw that I it was my number and assumed it was me being a dumbass. This is the correct response, because Marq knows me. On the back of my phone there is a little cover that goes over the battery. Every time I drop the phone it falls off, so I was not surprised that when I got the phone back it was missing. I rigged up a little duct tape replacement for the cover and was content with that. On my way to class on Tuesday, though, I found the cover untouched on the sidewalk. It wasn’t even covered with leaves or anything. My phone was whole again. That is my story about my phone. 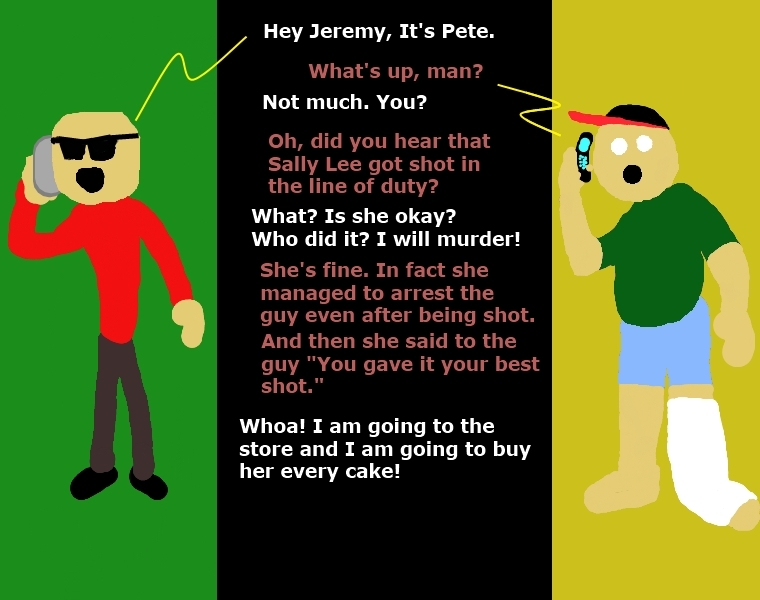 And now we start the third year of Phone Guys regular comics. I figured that maybe this year I’d put a little more effort in and have them be something good, instead of just filler. But then I went and started school again and didn’t have the time to bother with that, so they’re still just stupid. Oh well! We’ll all live with it. 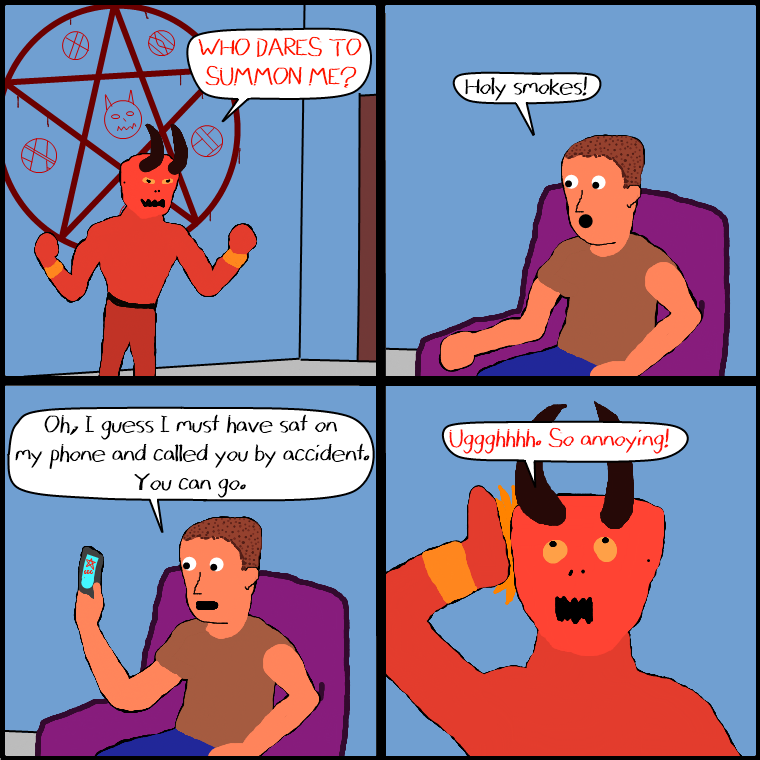 Also, we’re nearing Halloween, so why not see a demonic comic strip? Did you know that the word “Pie” comes from the Victorian-era phrase “Pan of Interesting Edibles”? Now you know. Feel free to cite this page as proof when you add this fact to Wikipedia. So how is everybody doing? Well, I hope. Me? I’m alright. The cold I had last week is gone save for some sniffling. My freaking internet is being slow tonight as I try to watch my stories, but whatever. You can’t break an omelet without making some new eggs, am I right? Anyway, for posterity I must mention that today was the final checkup of my mangled finger. It was a matter of the doctor looking at it for whole seconds to confirm that, yeah, it looks fine. Not much of a news item, but if I don’t document the minutia of my life on this site, who will? Bronson Pinchot? No, I don’t think he will. It’s up to me. 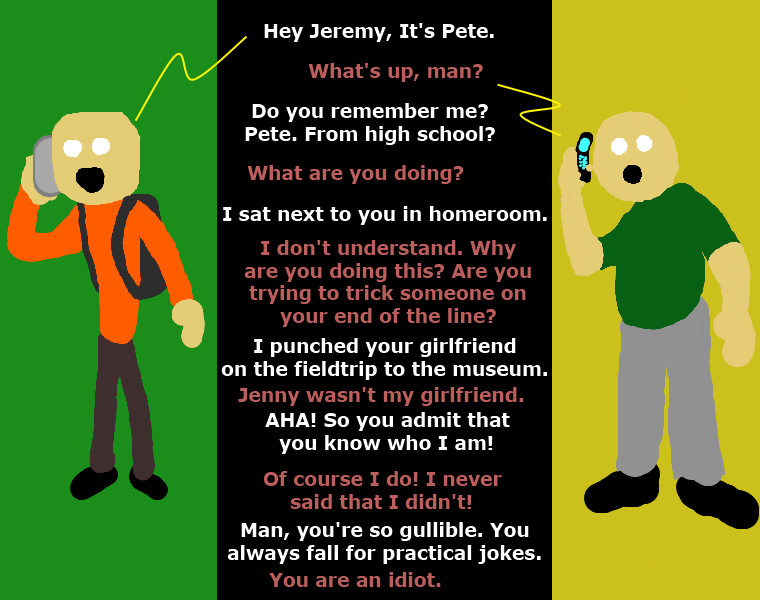 Here it is, the last Phone Guys from the 2011-2012 batch. It’s the action packed Season Finale. Next week we’ll be starting the 2012-2013 batch, which I just finished whipping up today.